Hc Verma i Solutions for Class 11 Science Physics Chapter 5 Newton's Laws Of Motion are provided here with simple step-by-step explanations. These solutions for Newton's Laws Of Motion are extremely popular among class 11 Science students for Physics Newton's Laws Of Motion Solutions come handy for quickly completing your homework and preparing for exams. All questions and answers from the Hc Verma i Book of class 11 Science Physics Chapter 5 are provided here for you for free. You will also love the ad-free experience on Meritnation’s Hc Verma i Solutions. All Hc Verma i Solutions for class 11 Science Physics are prepared by experts and are 100% accurate. A boy puts a heavy box of mass M on his head and jumps from the top of a multi-storied building to the ground. What is the force exerted by the box on the boy's head during his free fall? Does the force greatly increase during the period he balances himself after striking the ground? We can't find a body whose acceleration is zero with respect to all other bodies in the universe because every body in the universe is moving with respect to other bodies.As we live on earth which itself is accelerates due to its revolution around the sun and spinning about its own axis, so whatever observations and measurements ,we make , are w.r.t to earth which itself is not an inertial frame.Similarly all other planets are also in motion around the sun so tdeally no inertial frame is possible. In both the cases, change in momentum is same but the time interval during which momentum changes to zero is less in the first case. So, by F=dPdt , force in the first case will be more. That's why we are injured when we jump barefoot on a hard surface. According to Newton's third law, each team pulls the opposite team with equal force in a tug of war. Then, why does one team win and the other lose? The forces on the rope must be equal and opposite, according to Newton's third law. But not all the forces acting on each team are equal. The friction between one team and the ground does not depend on the other team and can be larger on one side than on the other. In addition, the grips on the rope need not be equal and opposite. Thus, the net force acting on each team from all sources need not be equal. Consider a book lying on a table. The weight of the book and the normal force by the table on the book are equal in magnitude and opposite in direction. Is this an example of Newton's third law? Yes, this is an example of Newton's third law of motion, which sates that every action has an equal and opposite reaction. Two blocks of unequal masses are tied by a spring. The blocks are pulled stretching the spring slightly and the system is released on a frictionless horizontal platform. Are the forces due to the spring on the two blocks equal and opposite? If yes, is it an example of Newton's third law? But it's not an example of Newton's third law because there are three objects (2 blocks + 1 spring). 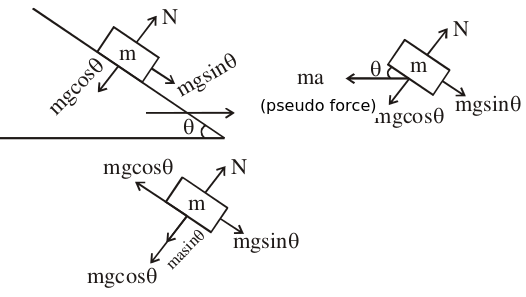 Spring force on one block and force by the same block on the spring is an action-reaction pair. When a train starts, the head of a standing passenger seems to be pushed backward. Analyse the situation from the ground frame. Does it really go backward? Coming back to the train frame, how do you explain the backward movement of the head on the basis of Newton's laws? No, w.r.t. the ground frame, the person's head is not really pushed backward. As the train moves, the lower portion of the passenger's body starts moving with the train, but the upper portion tries to be in rest according to Newton's first law and hence, the passenger seems to be pushed backward. A plumb bob is hung from the ceiling of a train compartment. If the train moves with an acceleration 'a' along a straight horizontal track , the string supporting the bob makes an angle tan−1 (a/g) with the normal to the ceiling. Suppose the train moves on an inclined straight track with uniform velocity. If the angle of incline is tan−1 (a/g), the string again makes the same angle with the normal to the ceiling. Can a person sitting inside the compartment tell by looking at the plumb line whether the train is accelerating on a horizontal straight track or moving on an incline? If yes, how? If not, then suggest a method to do so. No, a person sitting inside the compartment can't tell just by looking at the plumb line whether the train is accelerating on a horizontal straight track or moving on an incline. When the train is accelerating along the horizontal, the tension in the string is mg2+a2; when it is moving on the inclined plane, the tension is mg. So, by measuring the tension in the string we can differentiate between the two cases. The horse pushes the ground in the backward direction and, in turn, the ground pushes the horse in the forward direction, according to Newton's third law of motion. Therefore, A will go higher than B. In the upward direction of motion, aeff=g-a. In the downward direction of motion, aeff=g+a. According to Newton's second law which says that net force acting on the particle is equal to rate of change of momentum ( or mathematically F = ma), so if a particle is at rest then Fnet = ma = mdvdt = md(0)dt = m×0 = 0. Let F' = force exerted by the experimenter on block A and F be the force exerted by block A on block B. 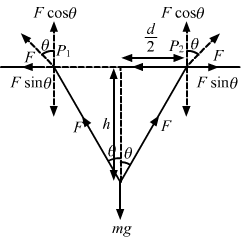 ∴ Force exerted by the experimenter on block A is F1+mAmB. So, the initial acceleration when the particle is released from a point x = 20 cm is 10 m/s2. i.e. k1+k2xm opposite the displacement or towards the mean position. As there is no friction between A and B, when block A moves, block B remains at rest in its position. As the man moves up, θ increases, i.e. cosθ decreases. Thus, F increases. So, the force exerted by the block A on the block B is 4 N.
And let the acceleration of the 3 kg mass relative to the elevator be 'a' in the downward direction. Suppose, further elongation, when the 1 kg block is added, is ∆x. When the ceiling of the elevator is going up with an acceleration 'a', then a pseudo-force acts on the block in the downward direction. The force of buoyancy exerted by the atmosphere on a balloon is B in the upward direction and remains constant. The force of air resistance on the balloon acts opposite the direction of velocity and is proportional to it. The balloon carries a mass M and is found to fall to the earth's surface with a constant velocity v. How much mass should be removed from the balloon so that it may rise with a constant velocity v? Let the mass of the balloon be M' so that it can rise with a constant velocity v in the upward direction. ∴ Amount of mass that should be removed = M − M'. Let M be the final mass of the box after putting some sand in it. A force F→=v→×A→ is exerted on a particle in addition to the force of gravity, where v→ is the velocity of the particle and A→ is a constant vector in the horizontal direction. With what minimum speed, a particle of mass m be projected so that it continues to move without being defelected and with a constant velocity? v will be minimum when sinθ = 1. After this time, the mass m1 also starts moving downward. So, the string becomes tight again after 23 s.
Mass of each block is 1 kg, sin θ1=45, sin θ2=35. Hence, acceleration of the block is 4.2 m/s2. So, accelerations of m1, m2 and m3 are 19g29up, 17g29 down and 21g29down , respectively. So, the acceleration of mass 2M will be a2. So, the force exerted by the clamp on the pulley is 2 Mg3 at an angle of 45° with the horizontal. Hence, the acceleration of mass M=2a=2×g6=g3 up the plane. Block ‘m’ will have the same acceleration as that of M', as it does not slip over M'. So, the acceleration of the 5 kg mass is 97 m/s2 upward and that of the 4 kg mass is 2a=2g7 downward. Acceleration of mass 2 kg is 2a=1013 g and 5 kg is 5g13. 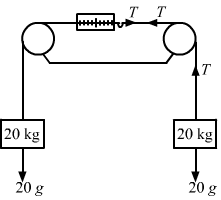 Acceleration of mass 2 kg is 2g3 downward. So, the acceleration of the 500 gm block is 8g13downward. 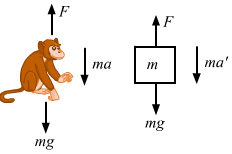 Hence, the time required to reach the ceiling is 10 s.
Suppose the monkey accelerates upward with acceleration a and the block accelerates downward with acceleration a'. If acceleration −a' is in downward direction then the acceleration a' will be in upward direction. (ii) To find his actual weight, suppose the force applied by the men on the rope is T because of which the box accelerates upward with an acceleration a'.Here we need to find T'. So, the angle formed by the ball with the vertical is tan-1 ag . So, the angle of incline is tan-1 ag. The displacement of the body is 20 cm during the first 0.2 s.